After above normal temperatures through early winter, cold temperatures finally return to ENC and return with a vengeance. Strong Arctic high pressure will continue it’s push through the central CONUS and deliver extremely cold temperatures to ENC on Thursday morning and after. Surface analysis at 7:30 PM EST. Temperatures overnight are forecast to dip into the low to mid teens inland with temperatures dropping down to the low 20s along the coast. Making matters worse, winds near 25-30 mph with gust over 35 mph will make it feel much colder. With dewpoints forecast to drop below 0ºF, wind chill values will drop near 0ºF or possibly lower. The NWS has already issued wind chill advisories for all areas of ENC. Temperatures will fall fast overnight. Tomorrow’s highs won’t provide much relief with temperatures only making it into the mid to upper 20s inland and low to mid 30s along the coast. The good news is there is no moisture to be had so frozen precipitation is out of the question for most with the isolated possibility for snow flurries right along the northeast coast (I would say less than 20% chance but greater than 0% with no accumulations). Winds will lessen during the afternoon providing relief from the low wind chill values overnight. 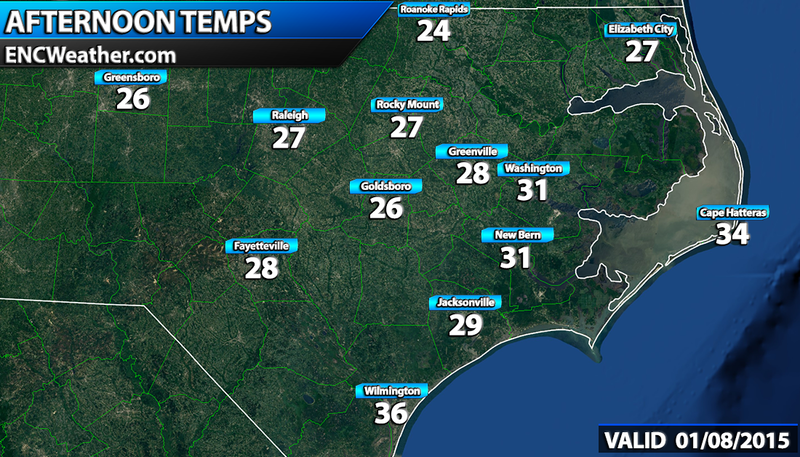 Forecast highs for Thursday across ENC. Thursday night will see temperatures once again fall back into the teens inland and low to mid 20s along the coast. Rain chances reenter the picture Monday and Tuesday as an upper-level trough approaches the region.